Mehdi karoubi one of green movement leader in a recent meeting with family members: I'm standing firm on my openions and position ! Mehdi Karoubi and Mirhossein Musavi together with their wives, close to seven monthe house arrest ! Mehdi Karoubi is one of the leader of the "Green Movement" and he was former speaker of the Islamic Republic parliament. Together with Mir Hosein Musavi, both ran in the last presidential election( almost three years ago ). The election was rigged and the cheating was so obviouse which brought millions of Iranian into the streets for protest which resulted so many Iranian people killed and thousends arrested and detained . This presidential election became known as the " election coup" ( 2nd coup in Iran - first in 1953). Because of the continued protest and unrest in Iran ,regime arrested both Karoubi and Musavi together with their wives and put them under house arrest.It is now close to 7 months both karoubi and Musavi are under house arrest. In recent days , there were news that regime decided to transfer Karoubi to another location and some speculated that, regime is planning to put Karoubi under torture for a forced confession video taping. Because of the lack of attention by regime to the Lake Orumieh in Azarbayejan-Iran , the lake is getting dried up and dying. In recent years there were warning about the situation of this lake but nothing was done to prevent it. In connection to this issue, the people in Azarbayejan -Iran particularly the people of the city of Orumieh held protest ( the video clip of this protest is posted in IRAN WATCH CANADA) and now in another attempt the civil society of Azarbayejan-Iran called for another protest on Saturday September 3rd @ 5:00pm and the communique also called the Iranian people in other city's to join the protest in solidarity with the people of Azarbayejan. The poster for the protest shows other citys like : Tabriz, Tehran , Mashhad, Rasht, Ardebil ,Zanjan, kermanshah, Isfahan and Orumieh are going to join the protest. To all Moslems around the world:How much do you know about the regime in Iran?Islamic Republic regime violates the rights of Sunni moslems! Protest against the Islamic Republic treatment of Sunni Moslems in Iran! Moslems of the world should not let the officials of the Islamic Republic regime and their embassys around the world with their money or donations and free food in festivities to deceive them and buy their support because of their money or the so called "fight with imperialism or fight with US as the great satan and fight with zionism" or promisses like Islamic Republic with Nuclear weapon as the only moslem states shall fight against injustices and ....so on. You should not be deceived! why ? because Islamic republic regime isn't what you thought it would be!? Ask the oppressed moslem and none moslem Iranian people to tell you about this regime !? This regime created terror and tyrannical regime in Iran. Among so many injustices one very close to you is your Iranian Sunni brothers who were asked not to hold their own "Eid Feter" festivity. They banned your sunni brothers from gathering into their mosque and pray. Instead they force them to join with other moslems including Shiit moslem and pray under khamenei's leadership in Eid Feter. As a result of this , many Kurdish representative from various Kurdistan city's in the parliament asked Mahmoud Ahmadinejad the "election coup president" to mediate and let the Suuni's communities residing in the western region of Tehran( Sadeghieh) to gather in their own mosque and celeberate the "Eide Feter'. This is one of the basic violation of the rights of Sunni Moslems. Marivan,Sarvabad- Mahabad- sardasht ,piranshahr- Seghez , baneh- divandareh,Kamiaran- Zahedan-Khash- Chabahar and ........signed this petition. New wave of protest has began in Iran.27.8.2011. Uromiyeh city- Clashes between people and regime forces! Iran. 27.8.2011. Uromiyeh city Protest against regimes politics ..
Iran,Tehran Aug.25th-Night time chanting- Khamenei's Dictatorship continue and Iranian people are waiting for that particular time and day ! A group of young Green Movement Iranian distribute leaflet with pictures of those killed by Islamic Republic regime in Iran among residences! Two years after the presidential election cheating or coup which resulted many young people killed ,thousands end up in jail and tortured or died under torture , Mohammad Sadegh Larijani the head of judiciary power on speaking with reporters said that: "Only one person was killed in Iran after the election" !!!???? Because of what Mohammad Sadegh Larijani had said, and what the familys of those killed are continue doing to bring justice to their case ,these young Iranian decided to speak with familys and prepared leaflets with pictures of martyrs and then distribute those leaflets among residence to expose the big lies of regime officials and support the familys of the martyrs. 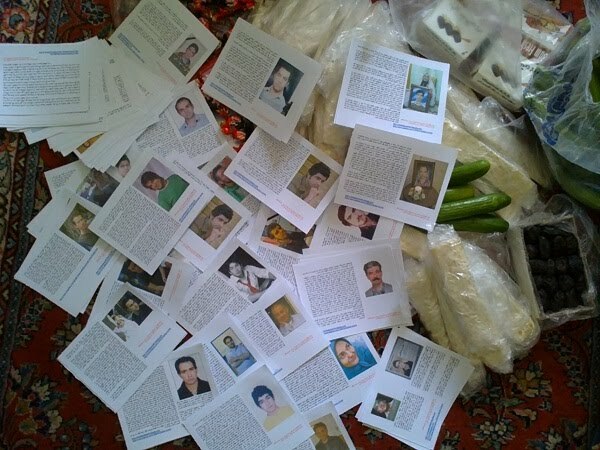 The young Iranian distributed leaflets with 43+ named and pictures of martyrs with bread and dates among residence. The end of all dictators(Escape,captured,dead),One way or the other!!! Power temptation! 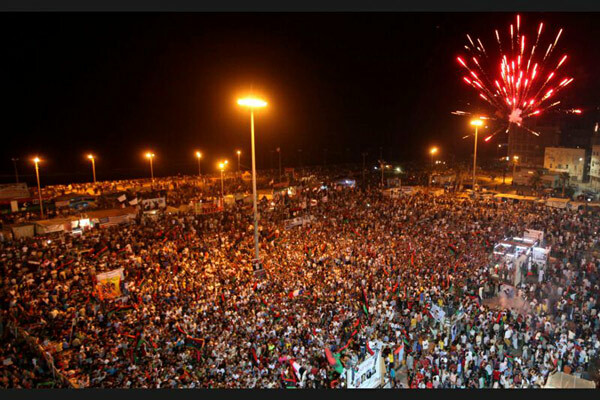 Democratic process in Libya is harder than regime change ! 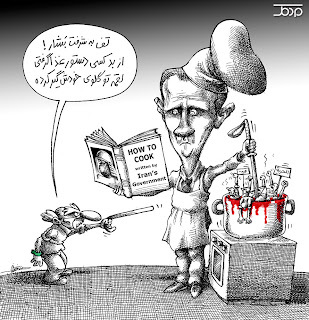 Can the regime officials in Iran and Syria learn from this experience or not ?????? According to news, the "Coordinating Council of Green Path of Hope " in it's 16th communique called the Iranian people to raise their voices at 10:00pm on August 25th,this coming Thursday night, against the reppression and Tyrannical regime in Iran and to expose the double standard policy of the regime with regards to Palestine and Syria . This call definitely will bring insomnia again to the eyes of regime officials. Plus School's will start in two-three weeks and the students campaign will resume . What about democratic changes in Saudi Arabia,Bahrain and..?Focous on Saudi Arabia. 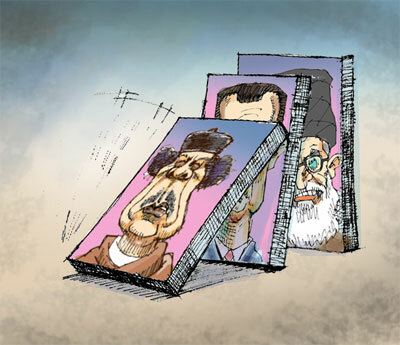 Regime in Libya,Syria and Iran are closer to collaps ! 8,19,2011 - Syrian people are serious in their struggle for democratic change ! Focus on Iranian Kurdish political prisoners ! Do we care ? Two more Kurdish Iranian political prisoners received death sentence in Orumieh city! total Kurdish political prisoners who have received death sentence is now 15 ! These two Kurdish political prisoners are: Ali Afshari and Mohammad Abdolahi.They are charged with "Actions against national security " and " War against God" . Ali Afshari was arrested in the city of Mahabad on January this year. at the time of arrest he had wounds needed to spend time in hospital. He was later transfered to "Orumieh Central prison".Mr. Afshari is accused of having connection with one of the Kurdish political parties. Ms. Zeynab Jalalian,Sirko Maarefi, Habibulah Latifi,habibulah Golparipour,Mostafa Salimi,Anvar Rostami,Jamal Mohammadi, Abdullah Sarvarian,zaniar Moradi,loghman Moradi,Ali Afshari,Mohammad Abdolahi,Rashid Aghkandi, Seyed Sami Hosseini,Aziz Mohammadzadeh. Looking on websites and searching for news , all you see is depressing and heartbreaking to hear what an inhuman situation the Iranian political prisoners have .Islamic republic regime in Iran together with its officials must pay the price for their inhuman actions against their fellow brothers and sisters for violating their basic human rights. The flag of Hezbullah and Islamic Republic regime plus the picture of Bashar Al Asad as three stooges were burned in Syria by Syrian people! Iranian Cartoonist Mana Neyestani's critical cartoon on Bashar Al Asad of Syria and Khamenei of Iran ! Spit on your dignity Bashar ! You have taken cooking order from someone who has mouthful and can't swallow. Focus on political prisoners -Mehdi Khazali,writer -blogger & critical to regime: " I'll start hunger strike & leave my dead body on your shoulders ! 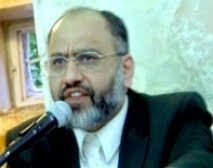 Doctor Mehdi Khazali is a writer and blogger which is critical to regime policies. He is on his 22nd days of hunger strike . According to his son , the prison officials transfered him from ward number 209 in Evin prison to ward number 350 in Evin prison.Doctor Khazali is the son of Ayatollah Abolghasem Khazali member of the "Assembly of Experts". According to doctor Khazali's son , his father was arrested on July 18 ,2011 infront of the Ministry of Information building by ministry's agents.Ministry's agents forcefully pushed him into a car and disappered.Based on report he has four charges against him , one was dropped and for other three charges, he was asked to prepare a 60 million Tuman Bail ($60 000). Doctor Khazali's son said; his grand father show no objection against regime's behaviour towards his son and so far the grand father did not make any attempt to contact his son's family. According to report on Iranian websites and blogsphere, 14 Iranian imprisoned journalists from Evin and Rejaei-Shahr prisons on "Rooze Khabarnegar" ( news-journalists Day in Iran- August 8) in a statement demanded for the release of Musavi and Karoubi and their wives from house arrests. Musavi and karoubi are the two presidential candidates who have protested the election cheating and bocome the leaders of the green movement in Iran. These 14 journalists who are also in prison descibed their situation as " Na-amn " ( Not safe) and demanded for civil rights and above all the freedom of expression - freedom of all journalists and their return to their profession. They also condemned regime security and despotic behaviour towards journalists and media. 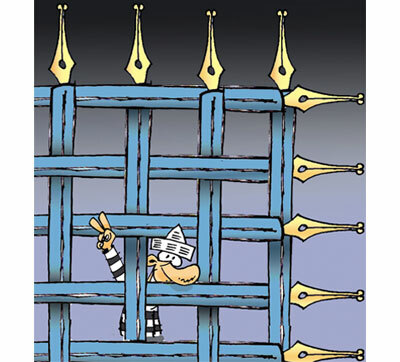 At present there are 40 Iranian journalists are in prison, Their association was forced to a closure, many journalists have been banned to work on their profession for years and so many felt unsafe to stay in Iran and left the country and are living in exile. Mohammad Reza Bahonar deputy to the Parliamentary speaker :We beg reformists to participate in the next parliamentary election!? Next Islamic Republic parliamentary election is going to take place in March 2012. Because of presidential election cheating or election coup by Khamenei-Ahmadinejad , Iranian people have no hope for a free election in the Islamic Republic regime.From now many reformists has boycotted the upcoming parliamentary election in March. and because of the fear of least participation in the election , Mr.Bahonar deputy to the house speaker said:"We beg the reformists to participate in the coming election"!? It is needed to say that, because of the rise of daily food and shelter expenses and working forces harsh living standard in Iran , more middle class families are also driven to the poverty line and as a result daily protest by workers, labour forces and farmers , regime has little success to drive people to this parliamentary election.Regime is afraid of the people's mobilization by social sector and organizers. Israel Protests: Over 250,000 join biggest anti-govt rally in Tel Aviv. Economy and democratic changes - Social forces behind the protest ! IRAN WATCH CANADA:Reports from Iran indicate many Iranian journalists are still in prison. It is hard to verify exactly how man Iranian journalists are in prison currently and it is because the regime always play games, releases one at one time and arrests others same day,or rearrest the same journalist again a few days later. This is the way the "just-ice" system works in Iran. Focus on political prisoners in Iran ! This time on Kohyar and his mom ! According to news regime security agents have arrested Mr. Kohyar Godarzi together with his mother Ms. Parvin Mokhtare. Kohyar Godarzi is a human rights activist . Kohyar and his mom were arrested on Sunday July 31 . Based on the news both mother and son were transfered to a prison in the city of Kerman. They were arrested by agents of the Ministry of information. He was arrested on charges based on his activities about human rights. In the past Kohyar was arrested once in December 2010 and spent a year in Rejaei-Shahr prison. IRAN WATCH CANADA will keep defending the rights of Iranian citizens and will never stop writing about their ordeal and situation they have to go through by this inhuman regime of the Islamic Republic.IWC Will continue to bring your voice to Canadian and the human rights organization around the world and no matter how far we live from each other but never forget you all. 5-8-2011(ج2).- Syria Friday Aug 5- The Syrian people want freedom and democratic change - Islamic Republic regime in Iran support Asad regime! Friday Aug.5 /Syria - Islamic Republic regime in Iran still support Bashar Al Asad and his regime and is against Syrian people ! Isa Sahahrkhiz, a prominent journalist and one of the founders of the Society for the Defense of Press Freedom in Iran has written a letter from Rajai Shahr prison to the UN Human Rights Special Rapporteur Dr. Ahmad Shaheed, urging him to take immediate action and travel to Iran. Isa Saharkhiz was violently arrested in July 2009 and consequently suffered broken ribs. He was later tried and, sentenced to three years in prison for “Insulting the Supreme Leader and the regime”, banned from all political and journalistic activities for five years, and prohibited from leaving the country for one year. 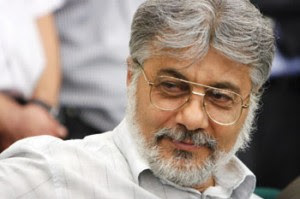 I, Isa Saharkhiz, one of the political prisoners arrested after the 2009 coupe election, have not been allowed to exercise my legals right of prison furlough for needed medical treatment, after having served half of my prison sentence. The news of your appointment as the UN Human Rights Special Rapporteur to Iran was heartwarming for me and many other political prisoners. We hope that you will be our voice in informing the public of the deplorable conditions of the prisons in the Islamic Republic of Iran. What is happening now in the Islamic Republic prisons is a crime against humanity and not any less than Stalin’s inhumane treatment of prisoners in the forced labor camps of Siberia. You have probably heard of the horrible death of Hoda Saber who died while on hunger strike after being beaten by prison officials. Prior to that, you must have heard of Mohsen Dokmechi’s death. You probably also are somewhat aware of my medical situation and are aware that they will not even allow me to be hospitalized for my needed medical treatment. I will not go into the details of my medical case. My purpose for writing this letter is to remind you that such a dire situation exists and that another tragic event may occur at any moment. 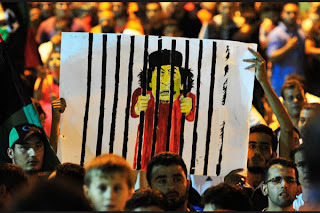 It is apparent to me and my fellow inmates that the strategy and objective of the authorities is “to kill the protesting prisoners silently and gradually”. You, in the name of humanity and because of the responsibility that has been bestowed upon you, are obligated to use everything in your power and act immediately to inform the public of the heinous [crimes] that occur behind these walls. I hope you realize the value of time in this matter and know that any delay in taking action will result in the deaths of more political prisoners. Therefore, I urge you to take action immediately and travel to Iran without any further delay. If the authorities prevent you from visiting with the political prisoners, that will only show another disgraceful act by a regime that is built on the foundation of lies. What compelled me to write this letter is the fact that we share a common background serving as diplomats for our countries. Such commonality brings us closer together and encourages mutual understanding of a single issue. With your remarkable background as Foreign Minister of the Maldives, now the most highest international organization trusts you to investigate the human rights situation in my country. Yet I, a temporary charge d’affaires and former ambassador in Helsinki, after 21 years of service in the Iranian Foreign Ministry, am now a political refugee in my host country, Finland. My colleagues and I, protesting against the merciless crackdown on the Iranian people and desiring to relay the cry of a suffering and helpless nation to the world, saw no alternative but to execute a political move reflecting all victims of the Islamic Republic’s human rights violations: the stifled voices, stitched mouths, bruised chins, bound prisoners, lost martyrs, childless mothers, shuttered newspapers, dissolved political parties, prohibited minority religions, and most importantly, punished defense lawyers. I write this open letter so I can reiterate the thousand-fold, relentless human rights violations in Iran. I’m very sure that dozens of UN resolutions, hundreds of statements from human rights organizations, and thousands of testimonies to the inhumane tragedies in the black well called the “Islamic Republic” are sufficient documentation to detail the crimes of depraved officials and vulgar rulers. Such records are enough to enlighten you of the tragedies that abound in the Islamic Republic. Is there better rationale than the Islamic Republic becoming the first country appointed a special human rights correspondent to investigate and assess its human rights situation since the Council’s founding in 2006? If there wasn’t any satisfying proof or documentation, the Council would never have thought of appointing Iran a human rights correspondent. I’m conveying pain in this letter, and, alongside the solid proof you have, I lay down my simple argument for the critical human rights situation in Iran. I contend that Islamic Republic senior officials’ harsh reaction of “blocking the correspondent’s entry into Iranian soil” only corroborates the depth of the horrible and monstrous tragedies taking place. The regime is even ready to justify its rejection of your shocking testimony to their crimes. This explains why Islamic Republic officials—from the head of the judiciary to the Foreign Minister, head of the National Security Council, and the IRGC’s Top Commander—hold the flag symbolizing their refusal to let you enter our dear country. Dissecting their foolish talk, it is very appalling that on one hand the president calls Iran “the most free country in the world” and Javad Larijani, head of the human rights desk at the Judiciary, calls Iran “the only democracy in the Middle East” while the Judiciary’s head Sadeq Larijani boldly announces that “Our policy is not to accept the correspondent”. Did the world forget that the Islamic Republic, until yesterday, was very keen on becoming a member of the Human Rights Council? Maybe the Islamic Republic forgot that it must execute the terms of a contract, treaty or convention unless it pulls out. What is the difference between accepting unexpected IAEA inspections of Iran’s nuclear sites (since the IAEA is an international authority), and accepting a special correspondent from another international authority, the Human Rights Council? Our country’s Judge of all Judges knows well that even if there wasn’t an international human rights treaty or any other treaty containing the Islamic Republic’s signature, these government officials would still have committed overt violations of the country’s laws and Constitution. Iran defying its international obligations is another story. Let me give you an interesting example. Based on the Islamic Republic’s civil code (derived from Islamic jurisprudence), a person is innocent until proven guilty by a legitimate court. It is appalling that in a country claiming to be free and democratic, two prominent Islamic Republic figures, former Prime Minister Mirhossein Mousavi and former head of Parliament Mehdi Karroubi have been under house arrest for five long months. Neither has a trial has been formed for them nor a verdict issued to sentence (or condemn) them. Considering the Islamic Republic’s contradictory treatment of the civil code and the Constitution, the question is: if Mehdi Karroubi announced that he would attend the trial himself and if these two men are criminals, then why their wives are under house arrest as well? You must acknowledge that the Islamic Republic’s problem begins with this simple example and ends with what Nobel Peace Prize winner Shirin Ebadi claims to be thousands of systematic human rights violations! Because you have a Muslim background, you know better than anyone else the meaning of shahid….which also happens to be your last name. Shahid means the one who sacrifices his life for protecting his greatness, dignity, and nation. No doubt that thousands of helpless Iranians have been martyred throughout the centuries, but we must note that during the imposed war with Iraq in the 1980s the term “living martyr” became popular. According to our fighters, the “living martyr” was someone who didn’t get martyred on the battlefield, but with his then damaged and broken body witnessed Saddam’s invasion of dear Iran. Dr. Shahid, if there weren’t thousands of martyrs for the cause of freedom, democracy, and human rights so that the report on the Islamic Republic’s inhuman abuses reaches you, then the Islamic Republic itself is a black well full of living martyrs who can illustrate for you just a small portion of these crimes. Some of these living martyrs are Mohammad Nourizadeh, Narges Mohammadi, and Nasrin Sotoudeh. Finally, we must not forget that although the troubling speech of the Islamic Republic leaders never ends, we cannot ignore the honest discourse of sympathetic people and human rights activists. Unfortunately, some exploit the issue of human rights as a political tool to acquire power—disregarding their country’s right as well as other countries’ opinions. You must acknowledge that such behavior only makes countries such as the Islamic Republic bolder in committing human rights violations. Although the solution to this problem does not lie in your agenda or your hands, we know well that you (as an individual internationally renowned in the field of human rights) are more eloquent and capable than anyone else to help end the exploitation of human rights. An entire nation and its future are bound to the serious task at hand, and I wish you success. We feel the warmth of a new hope in our hearts now and that is because after years of constant demands and trying hard by the victims of The Islamic Republic of Iran and their families, the United Nations, the highest international body, has finally appointed you as the special rapporteur to investigate the widespread and systematic human rights abuse by this regime. We feel fortunate that our cry that human right is an international affair and its investigation needs an international body has been heard. No doubt that even with a quick glance at the vast record, you will find out about the human rights abuses by the Islamic regime and the goal of this letter is not to provide new evidence. By this, we, as the voice of the oppressed mothers, see it as our duty to point out to you the difficulties of the task ahead and declare our readiness to cooperate in gathering evidence and witnesses to the victims of the regime. Because as Maurice Copithorne, the previous United Nations rapporteur has pointed out, you have a difficult task ahead and it is necessary that you be prepared for all the personal and professional attacks and the excuses and lies by the regime ( in an interview with Free Europe, March 26th 2011). Although the regime of Iran calls the Security Council’s resolutions worthless, its denial to accept any international envoy, shows the importance of such investigations in destroying its international legitimacy. Unfortunately, at the moment, the United nations lacks any practical ability to force the governments to accept the findings of its human rights rapporteurs, but it is clear that the isolation of those regimes with a widespread disregard for human rights, can only be achieved by such revelations and we hope to reach this with the help of you and other consciences people of the world. Obviously, the Islamic Republic would deny the existence of political prisoners, would hide the torture chambers from you and in best scenario, if they allow you to visit the prisoners, they put up a show to gratify themselves, as was the case with Galindo Pohl’s visit. You probably will never see the cells at an abandoned chicken ranch which is currently being used as a women prison and because of the lack of any sanitation facility, the prisoners have to relieve themselves by the side of their beds (2). You will probably not see the moment when the prison’s health workers, instead of caring for, subject an already weak prisoner on hunger strike and with a heart problem, to sever beatings that results in his death (3). You will not witness the selling of the prisoners for sexual abuses and would not be presented with an accurate statistics about the spread of aids and hepatitis as a result of widespread drug addictions and rapes. They will not show you the prisons with populations four times over the capacity and hide the mixing of the physically dangerous prisoners with the political dissidents and even the teenagers. The rulers will not tell you that even holding the pictures of the killed children by their mothers would result in intimidations, interrogations and imprisonment of their other children. They will hide from you the savage attacks to the peaceful silent marches or funerals and or the arrest of the participants. They will certainly not allow you inside the Khavaran cemetery (5) and will not invite you to see the empty seats of the college students killed at the university demonstrations. They will not show you the public stoning, hangings and retributions (punishment according to religious law, Ghesas). You will never see the torture chambers where the political prisoners are forced to make false confessions against themselves. Confessions that they know would result in their execution, but they do them willingly to put an end to the physical and psychological tortures that they are subjected to. But all this is only a small fraction of the story of the sufferings endured by the victims. It is hard to reach a deep understanding, unless there is a face to face meeting with them or their survivals under a safe condition. You certainly are aware of the long effort for the United Nations, this highest international body, to appoint a special human rights rapporteur. The high hopes for this appointment is evident from the letters from the Noble Peace Prize winner and defense lawyer, Shirin Ebadi, organizations such as International Campaign for Human Rights in Iran, International Federation of Human Rights Societies, The Society to Defend Human Rights in Iran and The Reporters Without Borders to the letters from the political prisoners leaked outside the walls with unimaginable difficulties and risks. These letters all ask for an immediate investigation of the horrible conditions of the human rights in Iran. Now, we the suffered but decidedly firm mothers are also demanding from you to echo our cries to the world. By this letter, we express that by your investigations and gathering of the information that you will submit to the United Nations, you create a ground to increase the international pressures on Iran to uphold its legal commitments to the International Human Rights Charter. The government of Iran as a member of the United Nations and international community, has to have regard for this international treaty or stay in international isolation. In this order, we ask you to do your best effort to make it possible to observe and investigate the conditions of the prisons in Iran closely and meet and speak to the political prisoners while insuring their security and safety. Meet with the family members of those disappeared or killed by the regime and publish their testimonies. And finally, try to identify those state agents who ordered and carried out the rapes and the executions of the political prisoners and dissidents and the shooting of the protesters. This may prepare the way to bring them to justice in a court of law, in a near or not so near future. It is our outmost desire that we, the suffering mothers, help you in this grave task. We hope to see a day that all mothers witness their children grow up and live in a peaceful, just and equal society. 1 - The Mothers of Laleh Park (Mourning Mothers) which was born out of the gatherings of the mothers of those killed during the May of 2009 protests against the results of the presidential election in various parks, hand in hand with all the mothers of the victims of dictatorial regimes, will never forgo the blood of their children and demand trial and punishment of those who ordered and carried out the street shootings, individual and mass execution of the political prisoners, ethnic and religious killings, illegal arrests, tortures, rapes and terrors and the nightly raids and creating mayhem at the student’s dormitories, especially after the 1980’s. The mothers of Laleh Park demand the unconditional release of all the political and consciences prisoners and abolishment of capital punishment. They believe capital punishment is a form of organized assassination and are against any assassination including stoning and the law of retribution. As past and present victims of violence and discrimination against women, they support any non-violent and justice seeking effort. Considering the suppressions inside the country, supporters of The Mothers of Laleh Park in other parts of the world, consider this their duty to bring their voice to the rest of the world. 2 - Pointing to Gharachak Prison in Varamin. 3 - Pointing to the killing of Hoda Saber, a journalist and political prisoner, who was on hunger strike as a protest to the killing of Haleh Sahabi. Haleh Sahabi was one of the “Peace Mothers”, who was on leave from the prison and was killed by the regimes agents at her father’s funeral. 4 - According to a letter from Mehdi Mahmoudian, an imprisoned reporter , and other political prisoners about the conditions inside prisons. 5 - The location of the mass graves of those executed in the 1980’s. 6 - One of the victims of sexual rapes by the interrogators at the Sepah Pasdaran prison in Sanandaj. 7 - Sohrab Arabi and Neda Agha Soltan were killed during the street protests of May 2009. Farzad Kamangar, a teacher executed in May 2010, is amongst the numerous executed political prisoners in Iran. 8 - Saied Zeynali was a student who went missing after getting arrested by the regime’s agents 12 years ago. After years of searching for him, his family not only did not get any answers, but the search resulted in the imprisonment of his mother, Akram Zeynali (Neghabi) as well. The UN's newly appointed human rights investigator to Iran called Wednesday on Tehran to allow him to visit the country to examine alleged rights violations there. "I issued a written communication to the Iranian authorities to introduce myself and express my interest in visiting the country," Ahmed Shaheed, the UN's special rapporteur on the situation in Iran, said in a statement. 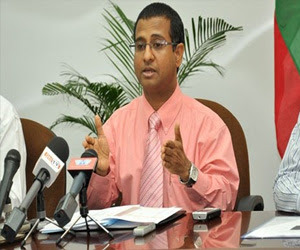 "It is my hope that the Iranian authorities will ... take steps to comply with its international human rights obligations," said Shaheed, a former Maldives foreign minister.Shaheed, who officially commenced his duties on August 1, said he was also asking to meet with the Iranian ambassador to the UN in Geneva, and planned to engage with activists.The UN Human Rights Council voted to create the rapporteur's position in March 2011, to monitor what sponsoring nations said were crackdowns on dissent and a surge in executions in Iran.The last UN Special Rapporteur on Iran's mandate was not renewed in 2002. Tehran had explicitly banned him from visiting the country in 1996.